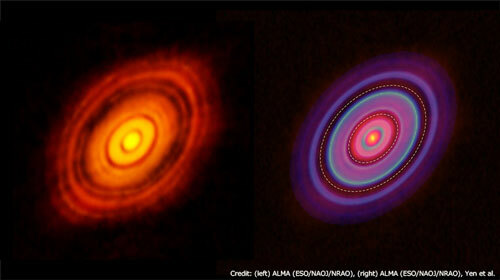 (Nanowerk News) A new analysis of the ALMA data for a young star HL Tauri provides yet more firm evidence of baby planets around the star ("Gas Gaps in the Protoplanetary Disk around the Young Protostar HL Tau"). Researchers uncovered two gaps in the gas disk around HL Tauri. The locations of these gaps in the gas match the locations of gaps in the dust found in the ALMA high resolution image taken in 2014. This discovery supports the idea that planets form in much shorter timescales than previously thought and prompts a reconsideration of alternative planet formation scenarios.